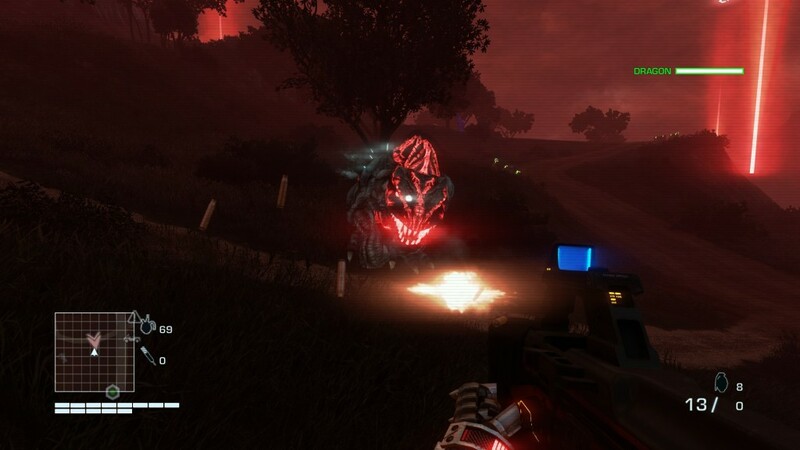 When I loaded up Far Cry 3 Blood Dragon I wasn’t sure what to expect. 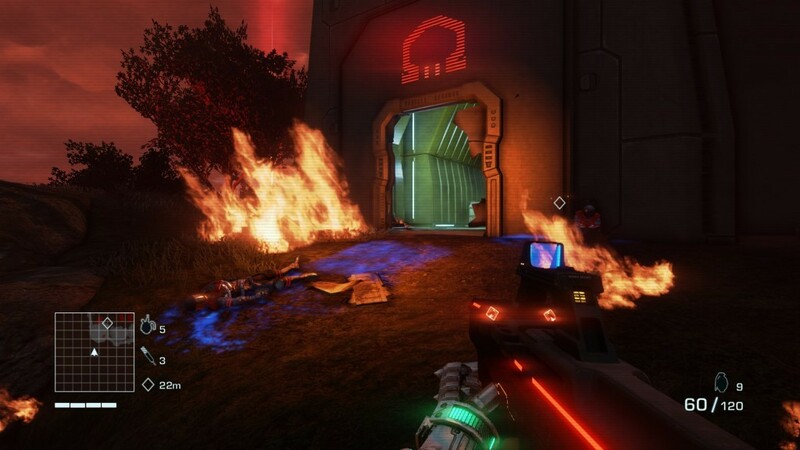 I had watched their surprisingly aggressive viral marketing campaign (for a DLC) with a passive interest but then a day before it’s May 1st launch date I discovered that Far Cry 3 Blood Dragon is a standalone product which doesn’t require the original game. I proceeded to preorder it immediately. Far Cry 3 Blood Dragon is a ridiculous celebration of the most bombastic movies of the 1980′s. It’s a salute to such venerated names as Schwarzenegger, Stallone, Van Damme, Siegal and Lundgren. It faithfully captures the over-the-top sequences of some of the most action packed and hammy movies ever to be released on VHS cassette tape. Far Cry 3 Blood Dragon tells the story of a cybernetically enhanced super soldier known as Rex “Power” Colt, a warrior of truth, justice and the American Way. In an alternate “future” of 2007, nuclear war in the 1990s has reduced Canada to an irradiated wasteland and has somehow led to the rampant advancement of cyber technology. Your mission is to infiltrate and defeat a textbook mad man planning world destruction on a nameless island, a plot on par with just about every cheesy action flick of the bygone era on which this game pays homage. …a tightly designed game where all the mechanics work well together resulting in pure unadulterated fun. On the surface Far Cry 3 Blood Dragon might simply appear to be a silly neon re-skinning of Far Cry 3 mechanics and a tongue-in-cheek shout out to the kind of action flicks Generation X and Y grew up watching, but as you progress it becomes apparent that this is a tightly designed game where all the mechanics work well together resulting in pure unadulterated fun. Far Cry 3 Blood Dragon made me realize just how much developers in the last decade have strived to remove pure and simple adolescent joy from their games possibly because they felt they were just “too cool” for that sort of thing. The super human mobility of your character is one of the joys of Far Cry 3 Blood Dragon. You stride across the land at a record pace without having to watch a stamina bar drain or listen to the protagonist’s asthmatic huffing five seconds later. You can leap enormous gaps and fall from a one hundred story dam and land on solid concrete without missing a beat. You can swim in open, cyber shark infested waters at speeds that dwarf even the provided boats and water skis. You really do feel like a super soldier more than capable of dispatching hundreds of faceless enemies. You can “paint” targets with your cyber-eye, which allows you to track them through walls. While it’s a very useful ability it also has the frustrating secondary effect of not allowing you to tell which particular side of an obstacle an opponent lies. They appear as brightly glowing silhouettes and because the entire word is shrouded in either heavy contrasting neon glow or pitch blackness it can be difficult to tell where in relation to you the enemy is patrolling. …rewards bold action instead of patience keeping the pacing perpetually high octane. 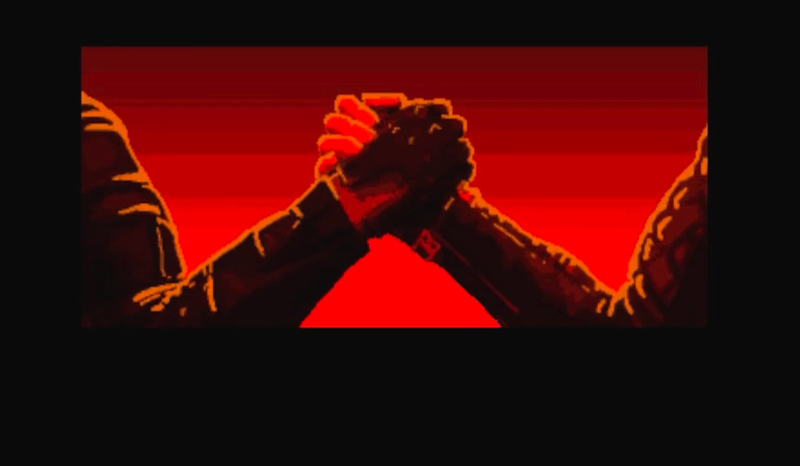 Stealth takedowns allow you to cross large gaps between you and your intended victim and eviscerate them, then continue a combo chain of mayhem by pressing a directional key toward your next opponent allowing you to take down multiple opponents with a glowing laser knife or alternatively throw an insta-kill barrage of shurikens if an opponent is out of combo range. It’s the kind of system that rewards bold action instead of patience keeping the pacing perpetually high octane. Far Cry 3 Blood Dragon concentrates on what makes video games fun rather than how to more accurately emulate the experiences of a real life soldier. Far Cry 3 Blood Dragon is an open-world shooter where you are tasked with liberating various bases that in turn unlock extracurricular missions which reward upgrades to your talents and weaponry. The island is dotted with red shafts of light shining the greek letter Omega into the sky like sinister bat-signals. Each pillar of light represents a base controlled by cyber soldiers of Omega Squad, an army of evil cyborgs who provide a majority of the cannon fodder for the overwhelming carnage you will unleash during the campaign. …fires so many bullets that you can hardly believe that it isn’t relegated to a specific scripted sequence. A minigun right out of Terminator 2: Judgement Day which fires so many bullets that you can hardly believe that it isn’t relegated to a specific scripted sequence. The other major threat on the island are the titular Blood Dragons. They are enormous carnivorous reptiles resembling Godzilla at a rave. Blood Dragons…are enormous carnivorous reptiles resembling Godzilla at a rave. They are bloodthirsty creatures eager to kill everything in sight. Using their primordial killer instincts to your advantage can make short work of the occupied bases you’re trying to liberate. 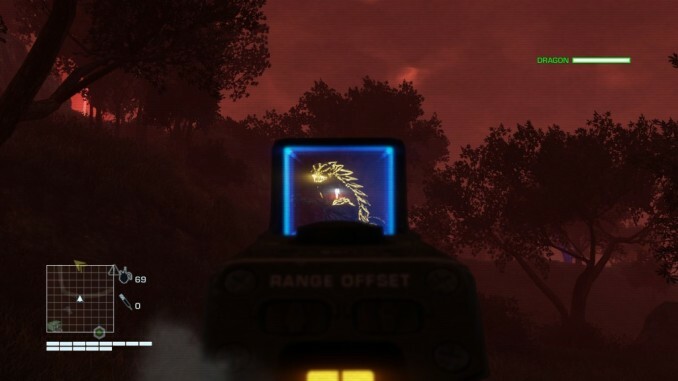 Every cyber soldier you kill can be “pillaged” netting you some cash and a few extra rounds of ammunition but also collect a blue tinted “cyber heart” which can be tossed like bait to lure Blood Dragons towards enemies where they then unleash their savage fury and do your dirty work for you. The Blood Dragons aren’t particularly clever and the challenge in fighting them really only stems from the fact that they are bullet sponges and have devastatingly over the top attacks that can easily one-shot you if you’re not careful. While it’s frustrating to take down one of these beast on your own, using one to charge the front gate of a compound and allowing it to wreak havoc while you simultaneously pick off distracted cyber soldiers is a satisfying strategy. When the carnage is complete you simple toss a tasty cyber heart out the front door or finish off the weathered Blood Dragon. Far Cry 3 Blood Dragon is hilarious. It is a fully self aware game that intends the player to groan at most of the cheesy dialog and extended sequences of high testosterone masculinity and ridiculous overkill. This can be considered both it’s greatest strength and weakness. The entire game is a celebration of excess. The explosions are bigger, the combat is crazier and the story is cheesier than anything else in recent memory. 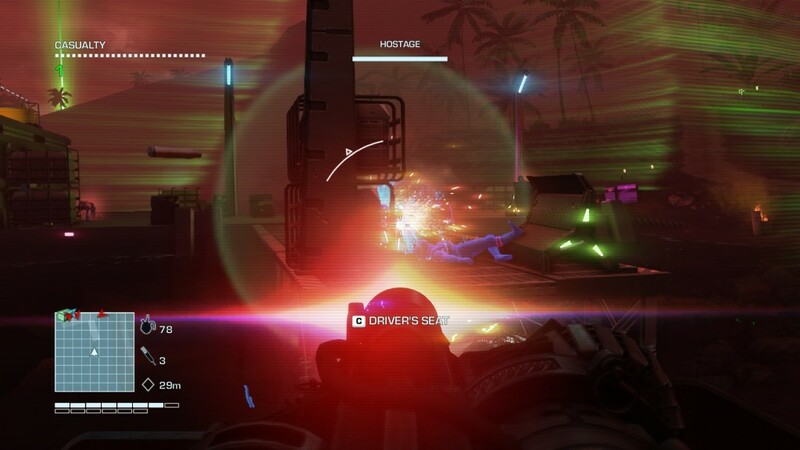 In order to enjoy Far Cry 3 Blood Dragon a player must be able to laugh at the ridiculousness of each and every moment spent with it. The 16-bit inspired cutscenes are especially enjoyable as they were made to look intentionally silly and you can’t help but crack a smile at some of the stilted animations and comedic quick cuts. 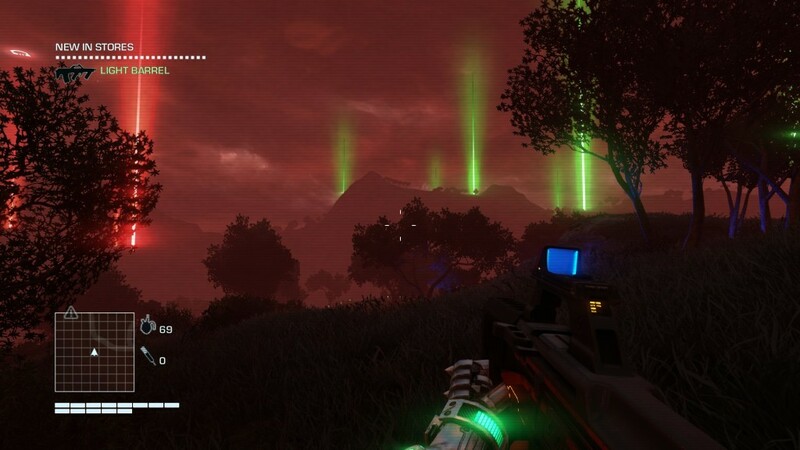 Far Cry 3 Blood Dragon is not without it’s flaws. First and foremost the setting begins to drag on. The island is in a perpetual state of darkness and the red slatted sky can become straining to look at overtime. Because the entire game takes place at night and nearly everything is awash in either neon glow or complete darkness you will constantly be visually scanning to identify just what exactly you are looking at. It really does feel like trying to watch a movie on a VCR…a tribulation some players may not be willing to undertake. It really does feel like trying to watch a movie on a VCR, which in this age of high definition clarity is a tribulation some players may not be willing to undertake. It’s early stages can be frustrating as the game relies on you to advance your skills down a very restrictive single path of unlockable upgrades. When you first arrive on the island you are woefully unprepared as none of your equipment functions at all like a weapon should, eventually you will grow into the super soldier your cyber eye and mechanical arm elude to but it will take several frustrating hours to get over that initial challenge hump. 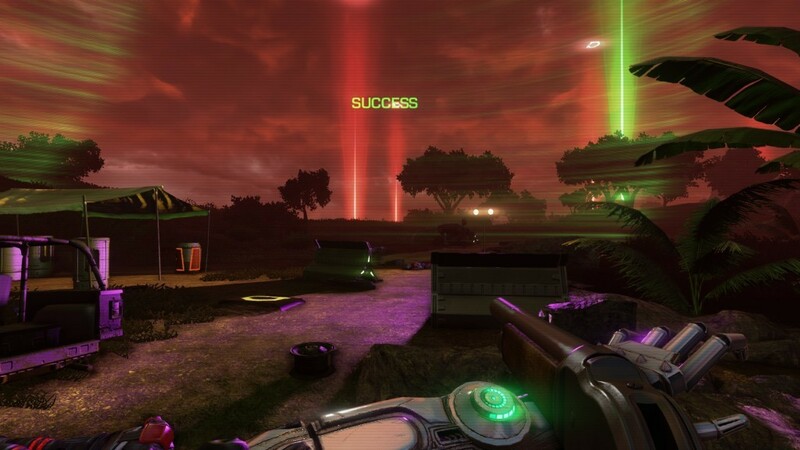 Far Cry 3 Blood Dragon is a really fun game. It offers many hours of entertainment and it is a special treat to anyone born in the 70s or 80s who who grew up watching and re-watching movies like Rambo, Robo Cop and The Predator. It provides more entertainment than many Triple A titles at a fraction of the price. There is very little reason not to like this game. 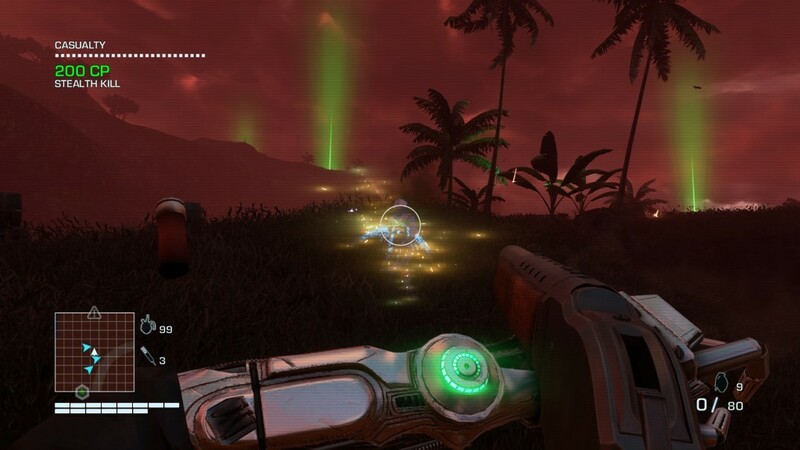 You can find out more about Far Cry 3 Blood Dragon by visiting the very humorous retro inspired official website or by visiting it’s Steam store page.